A new game for Android and iOS may change our understanding of nuns - those peacefully living religious women. Well, it turns out some of them might not be that peaceful, or at least that's what Nun Attack is trying to convey. The game let's you take control of 4 nuns: Eva, sister of guidance; Rosy, sister of deliverance; Olga, sister of protection; and Mandy, sister of holiness. Evil's probably most afraid of Olga, as her biceps are bigger than those of a California governor, and she likes to spit on the ground before reloading her weapon. Scary stuff, we tell you. The story goes like this: once a good sister, sister Mortanna has become a bad sister, and now she's spawning all kinds of vile creatures to wreck havoc. She obviously needs to be stopped, and that's what you and the four sisters will be fighting for. In addition to just blasting enemies with weapons, you will also have the option to perform miracle in order to aid your nuns in battle. 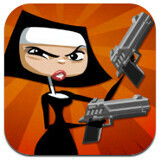 Nun Attack for Android is free, while iOS gamers will have to shell out $0.99. Highly disrespectful and inappropriate. What else is okay - a game with whites shooting blacks?? Dahli lama with an uzi? Plants vs muslim zombies? Oh no because only Catholics can be attacked without consequence these days. I'm ashamed at phonearena for posting this. come on dude... this game is really awesome!!! been playing it for like a week now and its great! How would you feel if u are a nun? and Do nuns go around killing and fking people up?! No!! You have no respect for religions! um, you are misinformed. Catholics have been brutally killing people who they think are zombies and witches for a thousand years. Catholics have killed more people in the lat 500 years then many wars combined. They killed people who did not think like them. They have killed people with arrows, swords, and guns! The game is perfect! Sorry... but I'm a Christian. I'm pretty sure Christianity has killed more people than Satan could ever hope for. But without getting into a debate over religion...why is this shocking to you? Lindsay Lohan did something similar and no one freaked out about it. http://media.247sports.com/Uploads/Boards/106/22106/39393.jpg Also there was a Resident Evil with a white guy killing about of black folks in Africa. If you ask me...religion makes man into Zombies...sooo...yeah. This game should have been taken off from Google Play and iOS. DISRESPECTFUL. Tried it and i was like im pissed. Good game play but... WTH!! NUNS?! This outrageous. Like anything in life, there is good and bad - in this game's case - you have good nuns and one bad nun. Would you prefer a game where catholic priests and altar boys are involved? wow, 175MB game - luckily I only do games on my tablet now. Thanks, P.A. - I will try it and see how it is. A nun is a member of a religious community of women, typically one living under vows of poverty, chastity, and obedience.. She may be a woman who decided to dedicate her life to serving all other living beings, or to be an ascetic who voluntarily chooses to leave mainstream society and live her life in prayer and contemplation in a monastery or convent. The term "nun" is applicable to Catholics – both eastern and western traditions – Orthodox Christians, Anglicans, Lutherans, Jains, Buddhists, Taoists, and Hindus. nothing about a nun not being able to fight back - thumbs down all you want - if you google nuns and fighting - you will even see that American nuns are fighting back against the Vatican - not physically, though. I knew something like this was going to happen when I first saw the game. c'mon mate.. we've seen games with priest vs demons, angels vs monsters, cowboys vs aliens.. so now why not nuns vs werewolves, ghosts & zombies? me thinks its cool! Build a bridge you stupid bible bashers. Stop taking yourself so seriously, it's just a fun game. Take your evangelism else where. This is how you chase people away from the church. Gawd! i tried this game..but i dont know how to control this! and there's this black bars!